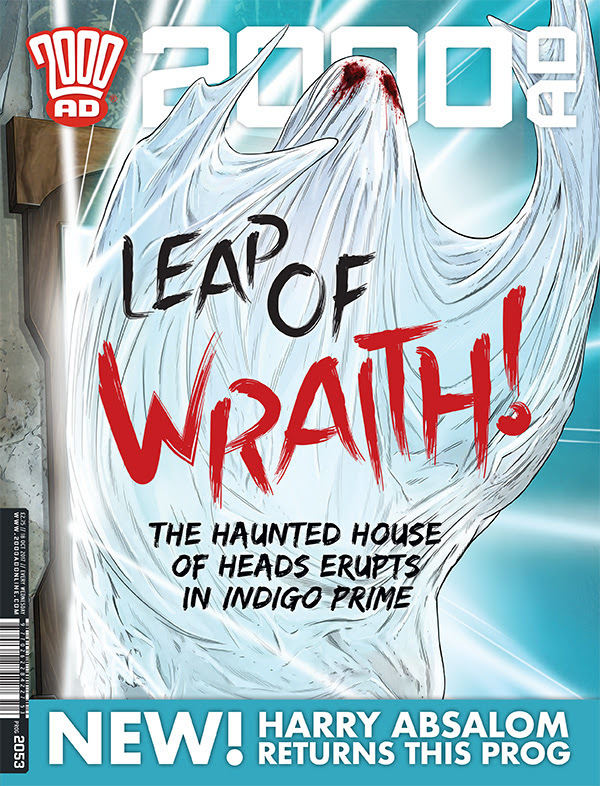 My thoughts on Prog 2053 of 2000 AD – out now! As a break from the grim stories we’ve been getting from Dredd, we get one about war! Well, the war is ended and this about the trial as it turns out a Mega City One company had been selling arms to both sides! Dredd is his usual self and there were many points that made me smile in this prog – including his almost sixth sense in finding trouble. In the end though it’s a good one-shot! the arc completes here, and I’m glad to see that Grey Area will return, but there looks to be problems for them in the future. That’s not to say that they don’t have their supporters! The team work well together and they really like a version of the A-Team. The reasoning and way everything was done makes sense in this world! Slaine makes his comeback and this prog is pretty action packed. Although not as gory as Slaine is fighting stone warriors, there is some blood involved in a key way! I did read the god as screaming at Slaine due to the lettering, it fits well. I like the final page of Slaine standing tall! Indigo Prime gives us a real Sci-Fi Horror feel, with future tech, universes, time/space and the horror as pects as the team go deeper into the imaganeers minds. I like the mix as there are many things going on here, within and on the outside. The blood and horror aspects were excellent! Is this the beginning of the end for Absalom? It seems that he has accepted his lot, and has plans in place to sot things out. This was a nice introduction to the character for those who haven’t read him, and a good read. Absolom is at his best here, and things are getting worse for him – he doesn’t have long left to get the grand-kids back. Meanwhile those higher up the food chain have their own problems with him, but there are more pressing concerns!